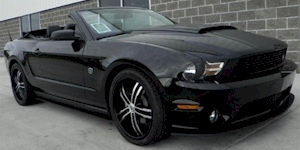 2011 Ford, DUB magazine, and Roush Industries come together to offer this DUB Limited Edition Mustang. DUB edition starts with a V6 Mustang coupe, convertible or glass top painted Black, Race Red, Ingot Silver, or Grabber Blue. Modifications include; Roush front fascia and splitter, Roush lowered suspension, 3.31 rear axle, quarter window covers, windshield banner, DUB stripe package, black interior with DUB embroidered into the headrests, unique 20-inch Pirelli wheels, and TIS tires. Ten all black all carbon fiber RTR-C versions are also available for a mere $135K. 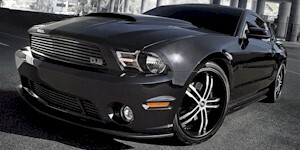 2012 Ford, DUB magazine, and Roush Industries come together again in 2012 to offer this DUB Limited Edition Mustang. DUB edition starts with a V6 Mustang coupe or convertible. Modifications include; Roush front fascia and splitter, Roush lowered suspension, 3.31 rear axle, quarter window covers, DUB stripe package, black interior with DUB embroidered into the headrests, unique 20-inch Pirelli wheels, and TIS tires.